One.com Review: Pathetic Uptime (99.79%) - Avoid! We purchased and set up a test website on One.com in December 2017. Since then, we’ve been collecting data on everything from uptime, to page loads, and customer service. Here’s a look at what we’ve discovered so far. Jacob Jensen founded the Denmark-based One.com back in 2002. Since then, they’ve grown into one of Europe’s biggest hosting companies, having 1,500,000 customers across 149 countries with almost the same number of employees. Impressive – no doubt. But stateside, they’re still virtually unknown. Especially when you stack them up against the likes of HostGator, Bluehost, and GoDaddy. Have they been quietly going about their business, growing organically by word of mouth? Or is there a compelling reason you’ve never heard of them? We decided to find out first-hand in December 2017. We purchased their cheapest plan, set up a WordPress website to test their service, and have been monitoring the performance ever since. You can check out the test website here and the detailed Pingdom stats here. Now, let’s take a closer look at their performance so far. One.com has backed up respectable load times with customer-friendly extras on each plan. And the pricing is among the most competitive we’ve seen. Google recently updated their mobile page speed benchmarks for companies. Makes sense when you think about it, right? Three seconds is almost an eternity when you’re browsing on your phone. If you stand to lose half of your traffic when your pages don’t load within three seconds, just guess how many would leave if it took five times longer? Pretty much all of them, most likely. Fortunately, our tests showed that One.com was able to consistently deliver an average of 666ms over the past eight months. That’s right: More happy site visitors. Here’s a look at the complete month-by-month performance. One.com is a European outfit that operates in almost 150 countries around the globe. Admittedly, that probably makes customer support a logistical mess. They have to deal with tons of different languages and time zones that are on the polar opposites from each other. Fortunately, they are doing a great job with this balancing act. They have an extensive knowledge base to help you find answers to common questions. If that doesn’t work, they offer support phone numbers for various locations around the world. Their email support promises answers within 24 hours. 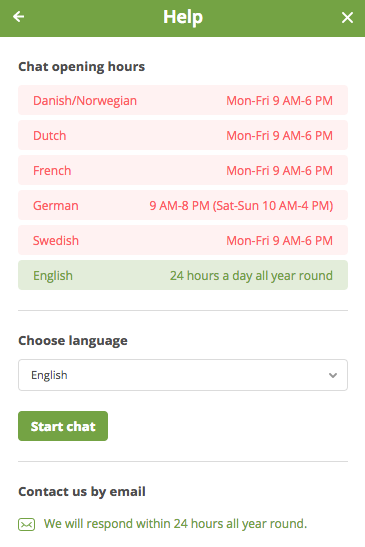 They also have live chat that’s available in multiple different languages during local business hours or 24/7/365 for English. We tested their 24/7 claims with a simple query, and Kathy connected almost instantly. Signing up for a web host can often feel like death by a thousand cuts. A grim picture, I know. A low rate on the website, but only if you prepay a minimum of three years in advance. A low rate on the website, that doubles or triples after the initial year. ‘Free extras’ like a domain name that are thrown in the first year, only to cost you in years two, three, etc. The best pricing trick (and by that, I mean the worst), is forcing customers to pay TONS for email accounts. For example, email addresses are typically free with a domain name purchase. Sure, you might want to upgrade to something like Google’s G-Suite for your business. But you don’t necessarily have to pay if you know your way around MX records. 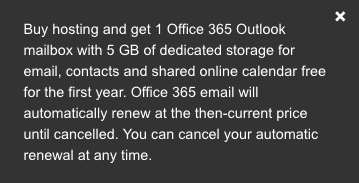 The worst offender here is GoDaddy, who wants to hold your email hostage and force you to fork over $60 per year for each email you use with their Outlook integration. Thankfully, One.com doesn’t play the email upsell game. Instead, they give you free email accounts on even their cheapest, most basic plan. SSL certificates offer shady web hosts another common upsell. They might even throw it in your account, ‘for free,’ only to stick you with a bill when it’s time to renew again. Back in the day, you didn’t really need an SSL certificate. The only sites that used them were e-commerce shops or other sites that process credit card transactions. They work by creating a secure connection between a visitor’s browser and your server, so no one could intercept any personal data being passed back and forth. Cybersecurity has ratcheted up in recent years as the number of hacks, data leaks, and breaches continue to explode. That prompted Google to add a measure to their market-leading Chrome browser that would effectively warn users when a website didn’t offer a secure connection. Might not sound too serious on the surface. You rightfully get a little fearful! Not to fear, though. One.com is here. They’ll throw in an SSL certificate on all basic plans (for no additional charge or hidden fee down the road). In an ideal world, you would just have an expert build a website for you. The only problem, of course, is that it’s often expensive. You need to hire a designer to craft the aesthetic. Then, you still need a developer to transform mockups into a functional prototype. Is this site for a business? You’ll still probably need more help, from someone to optimize it to others who can create the copy. Point is: Custom websites ain’t cheap. That’s where website builders come into play. They provide everyone from hobbyists to small business owners a user-friendly, DIY route to get a site up and running in no time. You can often drag and drop different site elements, creating the look and feel of a custom site for only a few bucks a month. You probably already recognize some of the most popular options, like Wix or Squarespace. If you go with one of those companies, you will have to use their own hosting, etc. Which means you’re not free to shop around or pick and choose the best setup. Or, if you start growing and want to move into a custom WordPress site down the road, you can’t. You’re stuck with their platform for the long haul. One.com offers their own website builder with each plan, along with popular open source apps like WordPress. That means you can start simple and create your basic site with a website builder. Then, you can always expand into something more complex in the future. Our test site on One.com performed well in the speed tests. That, in addition to their user-friendly site builder, unlimited email accounts, and SSL certificate, make it a decent option for new companies. Web hosts often use confusing technical details to describe their service. For instance, each plan might differ based on a certain amount of storage or bandwidth. The problem is that these numbers are often meaningless. Especially if you’re not an IT professional who deals with this stuff day in and day out. An average uptime of 99.70% doesn’t sound that bad initially, does it? That translates to over two hours of downtime each month! Over the course of a year, that adds up to 3 full business days. If you were going to use this site for your business, could you really afford your site going down for hours each month? One.com’s uptime started out OK. But ever since, it’s been getting worse and worse. In March, they were only able to deliver an uptime of 97.58%. That means our site was down for a full day that month! Let’s say you finally get that brand-spanking new WordPress site live. It’s taken weeks to get to this point. You hit “Publish” on the email newsletter to encourage your list to check out the new site. But before a flood of traffic comes to your site, two new plugins don’t play nice and cause a site conflict. 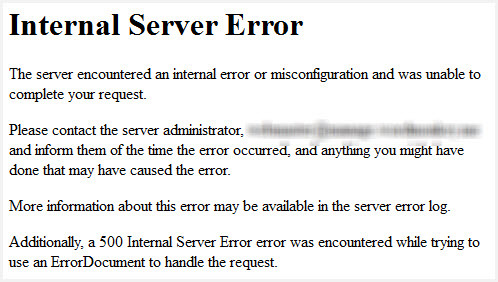 Unfortunately, these errors are pretty common on WordPress sites if you’re not careful. Outdated themes or plugins conflict with each other or don’t work with a recent WordPress internal update, and your site goes down. If you’re technical, a little work through FTP or the database can clean this up quickly. If not, a backup always comes in handy. 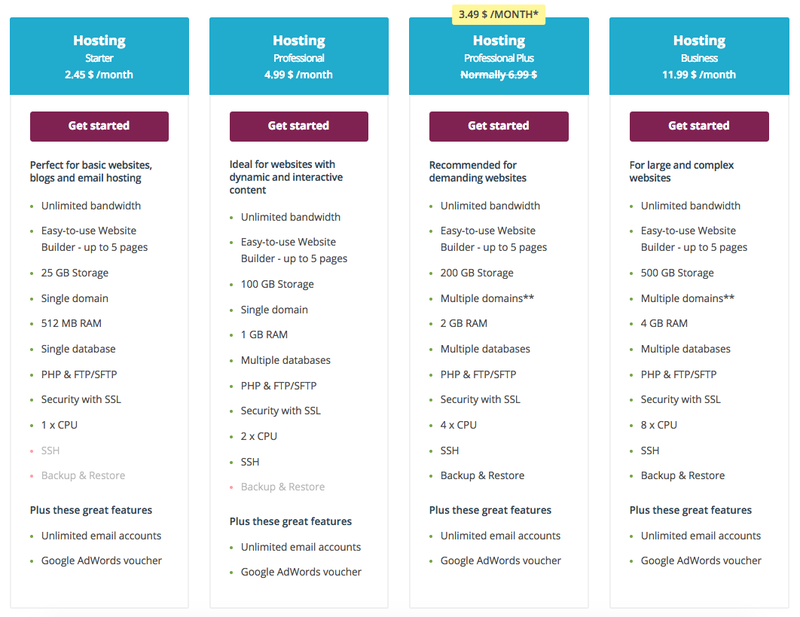 Trouble is, One.com doesn’t offer any backups on their first few hosting tiers. A few other hosts, like FastComet, will include daily backups on even their cheapest plan. They’ll store up to 30 days worth off-site so you can roll back to an earlier version within a single click. Not even having that option on a less expensive One.com plan is a little disappointing. Starter: One.com’s cheapest plan starts at only $2.45/month and includes a website builder, SSL, unlimited email accounts, and a single database. Professional: The next step up expands your site’s storage from 25 to 100GB and includes multiple databases, in addition to the other standard features. Starts at $4.99/month. Unfortunately, you still only get a single domain. Professional Plus: A current promotion makes their third offer just slightly more expensive than their Professional option at only $6.99/month. This one doubles your storage and finally includes the backup and restore functionality. Probably your best value with One.com. Business: The top-tier plan tops the charts at $11.99/month. But it includes pretty much everything you’d need for a business website. Free domain? It’s free for the first year. Payment Methods: Major credit cards and PayPal accepted. Upsells: A few upsells and high renewal fees for extra products. Installation of Apps and CMSs (WordPress, Joomla, etc. ): 1-click install tool to easily install popular apps and CMSs. One.com started strong. Their average page speeds were pretty good. Support options were also fast, which is impressive given their large, worldwide footprint. And we liked the fact that they threw in some extra stuff, like unlimited email accounts, SSL certificate, and website builder. No backups for their lower plans was a bummer. But the real deal breaker was the terrible uptime. Our site was down a full business day in March. That’s just not good enough at the end of the day. Therefore, unfortunately, we can’t recommend one.com. P.S. Click here to view the best performing hosts that posted both fast speeds and solid uptime. Do you have any personal experience with One.com – positive or negative? If so, please leave a transparent and honest review below! HOW DOES ‘ONE.COM’ RANK VS. COMPETITORS?